The 26 Baku Commissars were Bolshevik and Left Socialist Revolutionary (SR) members of the Baku Soviet Commune. The commune was established in the city of Baku, which was then the capital of the briefly independent Azerbaijan Democratic Republic, and is now the capital of the Republic of Azerbaijan. The commune, led by Stepan Shahumyan, existed until 26 July 1918 when the Bolsheviks were forced out of power by a coalition of Dashnaks, Right SRs, and Mensheviks. After their overthrow, the Baku commissars attempted to leave Baku but were captured by the Centrocaspian Dictatorship and imprisoned. On 14 September 1918, during the fall of Baku to Ottoman forces, Red Army soldiers broke into their prison and freed the commissars; they then boarded a ship to Krasnovodsk, where they were promptly arrested by local authorities and, on the night of 20 September 1918, executed by a firing squad between the stations of Pereval and Akhcha-Kuyma on the Transcaspian Railway. On 5 June 1918 the Baku Red Army repulsed an assault by overwhelming Ottoman troops, but later it launched an unsuccessful assault on Ganja, the headquarters of the Ottoman Army of Islam, and was obliged to retreat to Baku. At this point, Dashanaks, Right SRs and Mensheviks started to negotiate with General Dunsterville, the commander of the British troops in Persia, inviting his troops to Baku in order to defend the city from an imminent Ottoman attack. The Bolsheviks and their leftist allies opposed this scheme, but on 25 July the majority of the Soviet voted to call in the British, and the Bolsheviks resigned. The Baku Commune was imprisoned for participation in unlawful military formations and militarized robbery, particularly for the March Days atrocities and was replaced by the Central-Caspian Dictatorship. In contrast to what happened in many parts of Russia, where the Bolsheviks earned a reputation for ruthlessness executing those who did not support them, the Bolsheviks of Baku were not so strict. The Cheka in Baku executed only two persons, both members of the Soviet caught in embezzling public funds: the Commissar for Finance, Aleksandr Kireev, and the commissar of the steamship Meve, Sergei Pokrovskii. After the fall of the Baku Soviet in July 1918, the Bolshevik leaders and some loyal troops tried to reach Astrakhan, the only Caspian port still in Bolshevik hands. However, their ship was intercepted by the military vessels of the Caspian fleet and after undergoing an hour's bombardment in mid-sea they surrendered and returned to Baku. Most of the Bolshevik militants were arrested and remained in prison until, after the fall of Baku to the Turks, a commando unit led by Anastas Mikoyan freed them from their prison. Shahumyan, Dzhaparidze, Azizbekov, and their comrades, along with Mikoyan, then boarded the ship Turkmen, intending to reach Astrakhan by sea. According to recent historians, the sailors chose instead to sail to Krasnovodsk for fear of being arrested in Astrakhan. At Krasnovodsk the commissars were arrested by the town's commandant who requested further orders from the "Ashkhabad Committee", led by the Socialist Revolutionary Fyodor Funtikov, about what should be done with them. Three days later, British Major-General Wilfrid Malleson, on hearing of their arrest, contacted Britain's liaison-officer in Ashkhabad, Captain Reginald Teague-Jones, to suggest that the commissars be handed over to British forces to be used as hostages in exchange for British citizens held by the Soviets. That same day, Teague-Jones attended the Committee's meeting in Ashkabad which had the task of deciding the fate of the Commissars. For some reason Teague-Jones did not communicate Malleson's request to the Committee, and claimed he left before a decision was made. He further claimed that next day he discovered the committee had eventually decided to issue orders that the commissars should be executed. According to historian Richard H. Ullman, Teague-Jones could have stopped the executions if he wanted since the Ashkabad Committee was dependent on British support and could not refuse a request from its powerful ally, but he decided not to do so. On the night of 20 September, three days after being arrested, twenty-six of the commissars were executed by a firing squad between the stations of Pereval and Akhcha-Kuyma on the Trans-Caspian railway. How Anastas Mikoyan, who was part of the group, managed to survive is still uncertain, as is the reason why his life was spared. In 1922, V. Chaikin, a Socialist Revolutionary journalist, published a description of the moments before the execution. Isaak Brodsky's The Execution of the Twenty Six Baku Commissars (1925) depicting the Soviet view of the execution. Soviet officials later blamed the executions on British agents acting in the Baku area at the time. When Soviet rule was established in the whole Caspian area, Funtikov, the head of the Ashkhabad 'Directorate' responsible for the executions, was imprisoned. Funtikov put all blame for the executions onto Britain, and in particular Teague-Jones who, he claimed, had ordered him to have the commissars shot. Funtikov was tried and shot in Baku in 1926. Britain denied involvement in the incident, saying it was done by local officials without any knowledge of the British. This accusation caused a further souring of relations between Britain and the fledgling Soviet government and helped lead to the confrontational attitude of both sides in the coming years. According to Soviet historiography two British officers on board the commissars' ship ordered it to sail to Krasnovodsk instead of Astrakhan, where they found a government led by SRs and British officers who immediately ordered the arrest of the commissars. The Soviets would later immortalize the death of the 26 commissars through, among other things, movies, artwork, stamps, and public works including the 26 Commissars Memorial in Baku. In Isaak Brodsky's famous painting, British officers are depicted as being present at the executions. Boris Vladimirovich Sennikov published a book in 2004 about his findings on the Tambov Rebellion where he mentioned several facts about the event. Sennikov claims that the famous Brodsky's painting is an invention of the Soviet historiography. The truth was established by the special commission of the All-Russian Central Executive Committee (VTsIK) that arrived from Moscow. The commission was headed by Vadim Chaikin (PSR). The commission also consisted of a big group of a high-ranking Moscow's Cheka officers headed by Yakov Peters, an international criminal associated with the Siege of Sidney Street. Sennikov also brings up a quote of Chaikin in the article of Suren Gazaryan "That should not be repeated" in the Leningrad magazine "Zvezda": "The painting of Brodsky Execution of the 26 Baku Commissars is historically false. They were not shot, but rather decapitated. And the executioner of the penalty was a single man - a Turkmen, a gigantic strength bogatyr. That Turkmen by himself with his own hands using shashka beheaded all of them." The pit with remains of the commissars and their heads was uncovered under the surveillance of the VTsIK special commission and representatives of Cheka. The report on the death of Baku commissars was sent by the commission to VTsIK, Sovnarkom, and the Central Committee of RKP(b). In 1922 Vadim Chaikin published his book To the history of the Russian Revolution through the Grazhbin Publishing (Moscow) commemorating the first part "Execution of 26 Baku Commissars" to the event. After serving time in the Oryol Prison Chaikin on 11 September 1941 he was executed by a firing squad along with 156 other Oryol prison inmates during the Medvedev Forest massacre. Funeral of 26 Baku Commissars in 1920 (crying women are mother of the Mir Hasan Vezirov). The twenty-six "Baku Commissars" were not all commissars and were not all Bolsheviks; some of them were Left SRs and Dashnaks. There were many nationalities among them: Greek, Latvian, Jewish, Russian, Georgian, Armenian and Azerbaijani. 26 Commissars Memorial was a symbol of Azerbaijan SSR. In January 2009, the Baku authorities began the demolition of the city's 26 Commissars Memorial. This was the latest monument of several that had been built to commemorate the Commissars erected in that park during the Soviet period. This last monument itself had been fenced-off since July 2008. The remains of the commissars were reburied at Hovsan Cemetery on 26 January 2009, with participation of Muslim, Jewish and Christian clergy, who conducted religious ceremonies. "It is impossible to believe that they weren’t all buried. There is a film in the archives of 26 bodies being buried. Apart from this, my grandmother was present at the reburial." Almost all monuments in Azerbaijan dedicated to the commissars including Shahumyan, Azizbekov, Dzhaparidze and Fioletov, have been demolished. Most streets named after the commissars have been renamed. Russian prominent poet Sergei Yesenin wrote "Ballad of the Twenty-six" to commemorate the Baku Commissars, poem first published in The Baku Worker, 22 September 1925. Russian alternative music band WOMBA named one of its albums The 27th Baku Commissar. Italian prominent writer Tiziano Terzani wrote about the Baku Commissars in his book 'Buonanotte, signor Lenin' (Goodnight, Mr Lenin: A Journey Through the End of the Soviet Empire, 1992). ^ C. Dobson & J. Miller The Day We Almost Bombed Moscow Hodder and Stoughton, 1986. p94-95. ^ Richard H. Ullman Anglo-Soviet Relations 1917-21. Vol. I. Intervention and the War Princeton, N.J., 1961 p. 324. ^ Reginald Teague-Jones, The Spy Who Disappeared: Diary of a Secret Mission to Russian and Central Asia in 1918 Gollancz, 1990. ^ J.V. Stalin. "The Shooting of the Twenty-Six Baku Comrades". marxists.org. ^ "armymuseum.ru". armymuseum.ru. Archived from the original on 16 August 2006. ^ Gazaryan, S. That should not be repeated. "Zvezda". Leningrad, 1989. ^ Peter Hopkirk, Like Hidden Fire Kodansha, 1995. ^ «Российский исторический журнал». 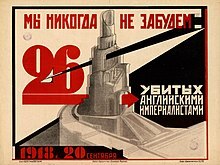 Расстрел бакинских комиссаров: 80 лет спустя. ^ a b c Фаик Меджид. В Азербайджане против демонтажа мемориала 26 Бакинских комиссаров протестуют только левые (in Russian). kavkaz-uzel.ru. Retrieved 17 January 2009. ^ Мурсал Алиев. Продолжается демонтаж мемориала 26 Бакинских комиссаров в Баку (in Russian). 1news.az. Archived from the original on 6 July 2011. Retrieved 17 January 2009. ^ a b c Zeinalov, Magerram; Vardanian, Gegham (2009). "Azerbaijan: Outcry at Commissars' Reburial". Institute for War and Peace Reporting. ^ "Remains of Baku commissars uncovered in centre of Azerbaijani capital re-buried". ABC.AZ. Archived from the original on 3 October 2011. ^ "Во время раскопок могилы 26 бакинских комиссаров в Баку не были обнаружены останки трех человек - ОБНОВЛЕНО". Day.Az. 26 January 2009. ^ "Ъ-Газета - Бакинцы недосчитались комиссаров". kommersant.ru. ^ Peter Hopkirk, On Secret Service East of Constantinople: The Plot to Bring Down the British Empire, Oxford University Press, 1994, ISBN 9780192802309. Minassian, Taline Ter (2014). "Some fresh news about the 26 commissars: Reginald Teague-Jones and the Transcaspian episode". Asian Affairs. 45 (1): 65–78. doi:10.1080/03068374.2013.872360. Wikimedia Commons has media related to 26 Baku Commissars. Nine Photos of past monuments dedicated to the 26 Baku Commissars, plus photo of the funeral. Azerbaijan International, Vol. 15:2-4 (2011), pp. 167–169. This page was last edited on 28 March 2019, at 18:47 (UTC).